LATE MARCH SPECIAL! JUST $250 per nite--SKI IN/OUT--SPORTS CENTER--SLEEPS 4-6! Our fabulous condo at Mt. 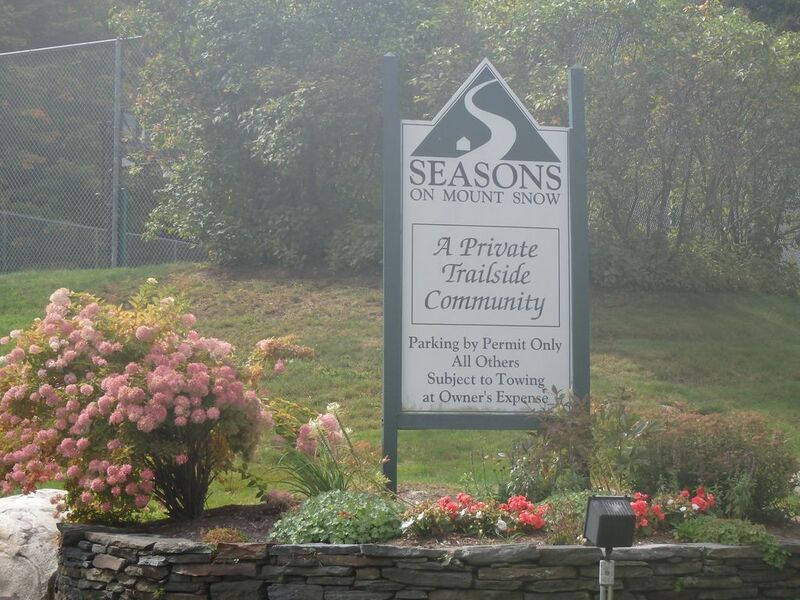 Snow has a ski in/out trail to and from the slopes and a wonderful amenities center featuring a large, heated indoor pool, two hot tubs, sauna, super clean locker rooms, a state of the art gym, comfortable lounge area with games, is staffed during the hours it is open and is available to all our guests. The outside pool is open in season for our guests enjoyment, too! Our lovely home has just been renovated and updated with tasteful furnishings and decor. The over-sized wood burning fireplace in the open concept living area is the perfect place to relax and unwind after a terrific day on the slopes. The private deck off the dining area looks out at the woods of the Green Mountains and is a nice, serene spot after a busy day in the Deerfield Valley. The ski in/out trail is right in front of the condo entrance making our home very desirable for our skiing and riding guests. Why not spend a weekend, a week or even a month in our wonderful condo and have one of the best vacations of your life! West Dover is 1 mile away. We are on Mt. Snow. Historic Wilmington is about 15 minutes away. We have a beautiful view of the hills of Dover from the living room windows and the private, second story deck. Right in front of the building the condo is in. Cell service is provided in the Mt. Snow area. Wood burning. Fire wood is provided at no extra charge to our valued guests. There is parking for two vehicles in front of the building and there is an overflow lot on the property, as well. Two dated parking passes will be available at the condo for our guests use. We do have wifi but it is very slow during peak holiday times in the Mt. Snow area. We recommend bringing beach towels if our guests are planning to visit the many swimming holes, lakes and rivers in the area. Please let me know if I can provide beach towels to our guests. In the nearby Sports Center. FREE FOR OUR GUESTS! We do have wifi but during peak holiday times it is very slow in the Mt. Snow area. With a beautiful floor to ceiling wood burning stone fireplace! Our lovingly renovated kitchen has all the amenities our guests might need. Our dining area has a private deck off of it. In the living room and second bedroom. In the Sports Center. Great lounge area with TV's, wifi, games and free popcorn. In the Sports Center and a ping-pong table, too. Rentals are at nearby Equipe Sports. A boat dock and boat rentals are at nearby Lake Whittingham. Off the dining area with a beautiful view of the hills of Dover. On the beautiful slopes of Mt. Snow, nearby Stratton, Okemo, Killington, Magic and Bromley. Across from the Sports Center as you come in to the Seasons community. SUPER GOLF SPECIALS AT NEARBY MT. SNOW GOLF COURSE. ASK ME! The outdoor community swimming pool is open in season and the indoor heated pool in the Sports Center is open all year. The Condo was exactly as described. Super clean, well equipped and just right for a relaxing weekend at Mt. Snow. Thank you Karen for your great communication and a extremely smooth booking experience. My family had a great time and we all look forward with visiting again next season. The condo was spacious and well appointed. We had everything we needed, and only steps from the ski trail. You can see they've been putting upgrades into the condo. The bathrooms are a little quaint, and need some further refinement, but overall both are satisfactory. The condo desperately needs a humidifier... it's very dry. Hi, Mark. Thank you for the nice review! I really appreciate it. Thanks also for your suggestions, and, yes, we are make some improvements to our condo and we hope you will like them when you come back for another visit. I apologize that I did not know you might like a humidifier. I do keep one at the condo for guests who ask for one but it is in our storage closet. Going forward, I am going to put it in a closet that guests can get to so more folks can use it, if needed. Thanks for choosing our condo for your VT weekend! Have a great year! Another terrific vacation in this beautiful home!!! We loved the place. Easy to get to by car or ski. Real fireplace and comfy couches! Bedrooms nicely furnished. Washer and dryer helpful. Owner super accommodating and sweet. We will be back. But wait - if you haven’t been to Mt Snow you have to try it. Great mountain, super runs, and no snooty attitude. Thanks for your great review, Susan! And thanks for being a super ambassador of Mt. Snow. It really is a fun, family-friendly mountain and we are happy you liked the location of the condo. Please keep us in mind for another visit! Happy Winter!